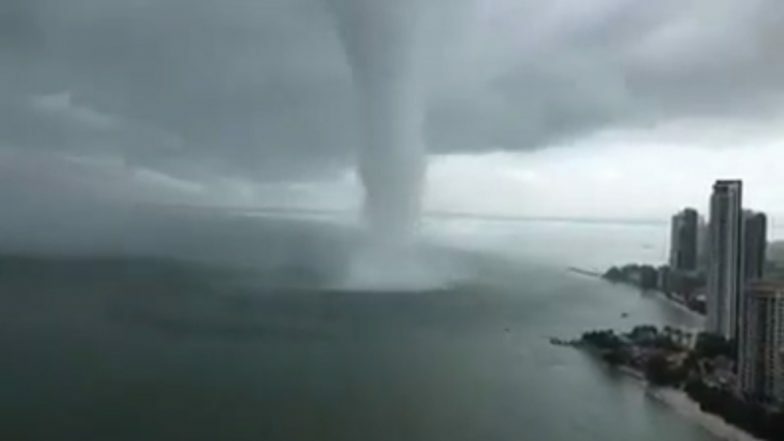 A huge waterspout was spotted on Penang Island near Malaysia. Dramatic footage that is going viral on social media shows the waterspout moving to the shore and finally makes landfall. Pictures and videos of the rare natural phenomenon which looks straight out of a sci-fi movie have gone viral on social media. It was spotted in the Tanjung Tokong area of the city of George Town on Malaysia's Penang Island. Last month, residents of the United Arab Emirates had spotted a mysterious hole in the sky called 'fallstreak hole'. The waterspout was accompanied with strong winds in the island. While it did not cause any big casualties, around 200,000 people who reside in the city were affected. According to Channel News Asia, the waterspout damaged at least 50 houses and fell several trees. Roofs of some houses were blown away in the wind. The Penang Civil Defence Force spokesman confirmed that nobody was injured in the occurrence.